Born at the Osaka University Hospital with her twin sister Saya. Was born at the weight of 1850g as a low-birth-weight infant and was hospitalized for about a month until her weight increased. After being discharged from hospital, the sisters were healthy and stayed at their grandparent’s home. By the time they were two months of age, Suzu’s sister Saya’s weight stopped increasing and she stopped drinking milk. She went in for a medical examination at the Suita City Hospital to find that she was causing heart failure and was quickly transported to the National Cardivascular Research Center. 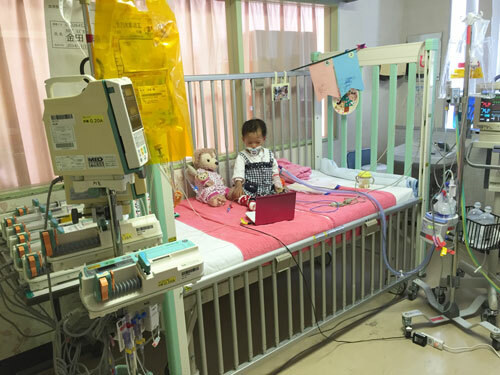 The next day, since Saya was diagnosed with “severe pulmonary hypertension with the progress of pulmonary vein stenosis”, as twins, Suzu also got a checkup and was also diagnosed with the same disease. The girls were admitted to stay at the hospital for medical examination. Progress of the disease was found through an outpatient echo examination and was hospitalized again from the 31st. Left the hospital. Stays for a little while at home taking Domiciliary oxygen therapy and internal medicine. Suzu’s twin sister Saya died. This day was the day after Saya’s registration of cardiopulmonary simultaneous transplant to the Japan Organ Transplant Network was certified. Blood test results show that the value of the BNP which indicates the stress/pressure against the heart has risen. Hospitalized again and begins treatment. Her medical conditions become worse and requires 24 hours of inotopic agents and starts drip infusion treatment of diuretics. The registration of cardiopulmonary simultaneous transplantation (*) in Japan is completed. Starts high concentration oxygen inhalation. Increases the amount of inotropic agents due to high heat thought to be caused from pneumonia. Receive an unofficial letter of admission for a lung transplant from the Cincinnati Children’s hospital in Ohio, America. (※)Within Japan, for physical issues and issues to do with transplant surgery, she has been registered for the cardiopulmonary simultaneous transplant (to receive a transplant for both the lung and heart at the same time). 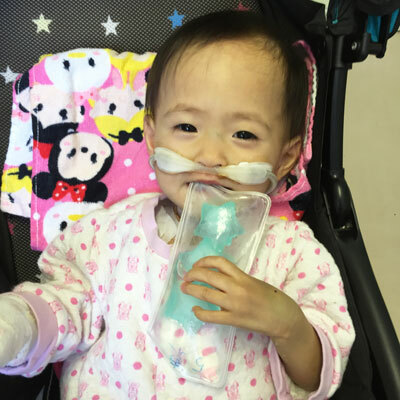 Suzu will be trying to head to the United States, as the hospital which she will be admitted to, is a hospital which has a lot of lung transplant experience for this disease. The pulmonary vein stenosis is an incurable progressive disease which cause is unknown, certified by the Ministry of Health, Labour and Welfare. The symptoms show the pulmonary vein to become constricted/narrow or blocked which cause is unknown. Those which are congenital are particularly fast in progress and in most cases do not make in time to register for a transplant even within the country. There are a total of 4 pulmonary veins, 2 to the left and right, which are blood vessels which send blood from the lungs to the heart. If all of them are blocked, the patient will not be able to survive. When the pulmonary vein becomes narrow, the circulation of blood through the lungs decreases. In order to send enough blood from the right ventricle of the heart to the lungs, the blood pressure in the artery will increase. This condition is called pulmonary hypertension. The right ventricle which sends blood through out the whole body, like the left ventricle, will not be able to withstand the high pressure which eventually causes heart failure leading to death. Even in a state in which not all 4 pulmonary veins are blocked, the patient may die due to right cardiac failure. In this condition, the pulmonary vein itself is extremely thin, since the joint of the pulmonary vein and heart is constricted. Therefore, drug treatment, surgery, Catheter treatment such as Stent treatment can not be applied. There is no other option but to have a transplant. In the case of Suzu, already 2 of 4 pulmonary veins are completely closed and 2 are narrowing. Blood pressure in the pulmonary artery is also rising and is already at a state where she cannot live unless there is no infusion of inotropic agents. The state of pulmonary hypertension is severe and the heart is in a critical state reaching its limits. Her twin sister Saya had the same disease which became severe before Suzu’s did, and has already died. 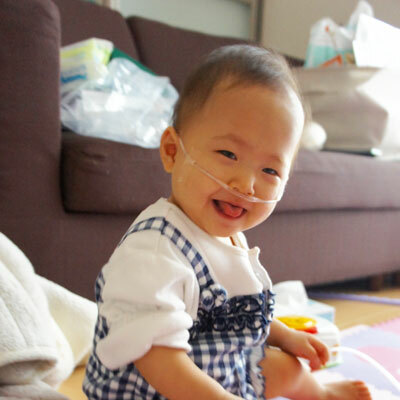 Suzu is in need of a lung transplant as soon as possible. 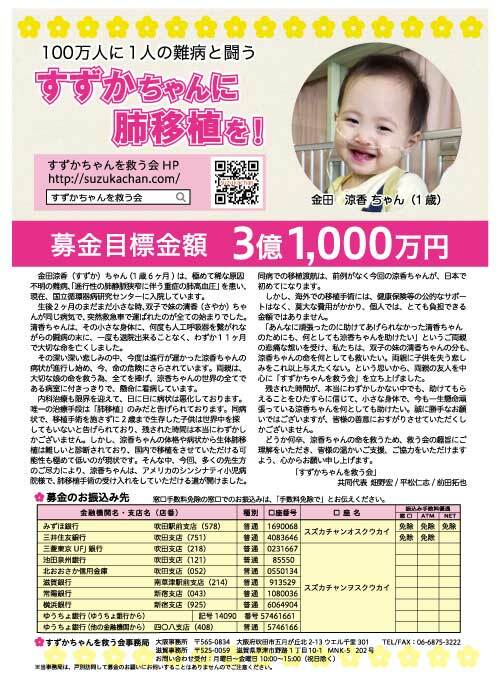 So far in Japan, there is no child who has survived from getting a lung transplant. There are only a few hospitals in the worldwide that have the experience of lung transplant of this disease.